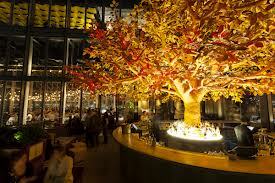 If you’ve ever read/watched Charlie and the Chocolate Factory, then you’ll love Sushi Samba. There is absolutely no relevance to Roald Dahl’s classic, nor is there much chocolate involved, but the first thing you will experience on arrival is the glass elevator that hurtles you to the 40th floor in about 7 and half seconds. It’s not for the faint hearted, semi-drunk, very drunk or anyone that suffers from vertigo. But close your eyes and it’s totally worth it. It’s certainly a restaurant with a view and once you recover from the G shock the balcony bar, with spectacular views of the city and buzzing atmosphere will certainly make it worth your while. If all else fails, there is a great cocktail menu, which you can take full advantage of to get yourself back down. The menu – an eclectic fusion of Brazilian and Japanese classics. Sounds strange, but it totally works. The yellowtail taquitos and rock shrimp tempura were to die for and steaks were served sizzling and ready to share. The desserts were particularly special, but after a cocktail, G&T, sake and wine, I couldn’t tell you what they were, only that they were gooood. Staff were friendly, willing to help and more than happy to keep the sake flowing (so really it’s their fault that the dessert is a blur). The drinks covered every taste from exotic cocktails to an extensive wine list. After the meal, which we managed to drag out for hours (without any snooty time limits for a second sitting -a pet hate) we took a stroll onto the balcony, which somehow managed to dwarf, not only the Gherkin, but Tower Bridge. Taking to the bar for a post meal cocktail, the music was fantastic, atmosphere electric and if you could tear yourself away from the city skyline and next to a patio heater, you could be excused for feeling as though you were on holiday, somewhere warm. That is, until the wind picks up.